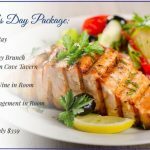 Our Mother’s Day Brunch menu includes Anadama French Toast, Lobster Frittata, Grilled Salmon, soups, salads, hor d’oeuvres and desserts. Gluten-free options are available. $50/person and $25/child (ages 3-12) excluding tax, gratuity, and alcohol. Sunday, May 12th with seatings from 11 a.m. to 3 p.m. and live music from 11:30 a.m. to 1:30 p.m. Call to reserve a table for brunch at 978-546-6321.